Home › Artist's Commentary › How Thin Can You Go? How Thin Can You Go? 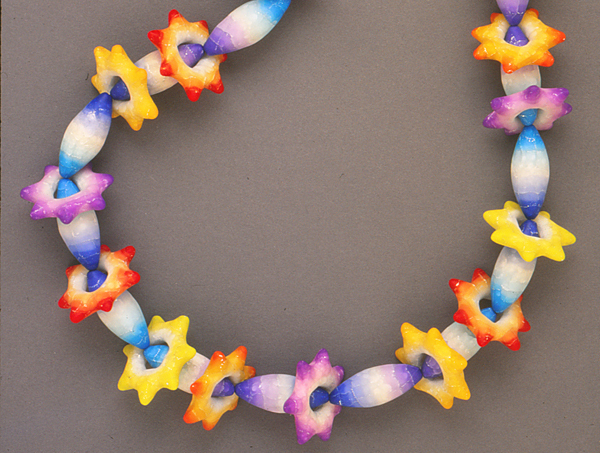 An important focus of this archive has been to make connections, to illuminate significant threads of development in polymer art. We’ve heard first-hand on this subject from many authoritative voices in the medium’s history – Victoria Hughes, Stephen Ford, Kathleen Dustin and the rest of our “founders.” In archiving these artistic lines, I’ve attempted to step aside as much as possible and allow others to speak for themselves. But when it comes to the technique of using super-thin sheets of polymer, I want to step forward and offer my own memories and experiences because of the personal contribution I was able to make in this area. This article traces three linked events in the development of our medium, and tracks those connective tissues back in time, from 1998 to 1995. Art jewelry enthusiasts, as well as museum personnel, should be familiar with Cynthia Toops’ Rolodex bracelets. 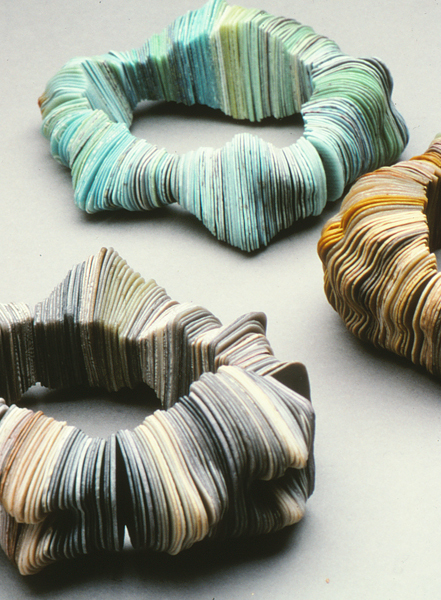 In these wonderful pieces, Cynthia threads together dozens of paper-thin sheets of polymer. And it is on these sheets that the bracelets’ inner beauty hides; exquisite drawings and designs on the surface of those leaves, waiting to be noticed by those with what you might call “inner vision.” These bracelets, among her earliest work with thin sheets, were executed in 1998. 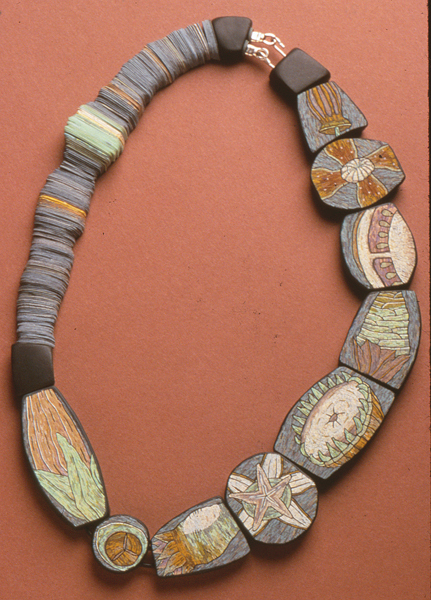 Cynthia went on to use them in combination with her signature micro-mosaics as in the necklace below. Cynthia has been quoted, attributing Kathleen Amt’s book pendants as an influence in her rolodex pieces. 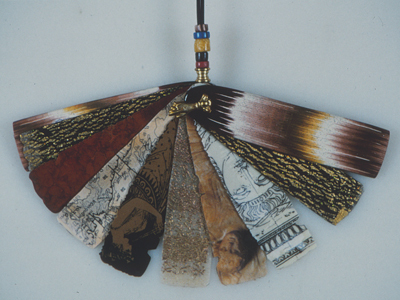 Kathleen had presented a book pendant workshop at the NPCG Arrowmont conference in 1997. She later published a how-to article and taught that workshop at guilds across the country. So where did Kathleen’s inspiration come from? She flexed my brooch a few times as I explained the techniques I used to avoid bubbling and to ensure strength. With that Kathleen declared, “I can’t wait to see what I can do with this.” My brooch also caught Nan Roche’s eye at that meeting. Although I was a relative unknown in the polymer community at this time, Nan, having viewed this single piece offered up a spontaneous invitation for me to create a contribution for the chapter on surface decoration in her next edition of The New Clay. 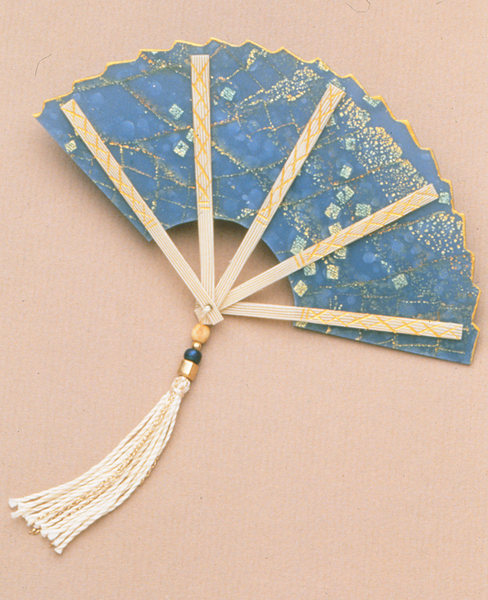 For years I had been collecting handmade fans, especially fine examples from Japan. Through out the previous winter I had been working on a fan-shaped brooch in my metalsmithing class, but hadn’t completed the design. By the time I’d reached home, 5 hours later, I’d determined to find a way to use polymer as the primary design material for a fan brooch. 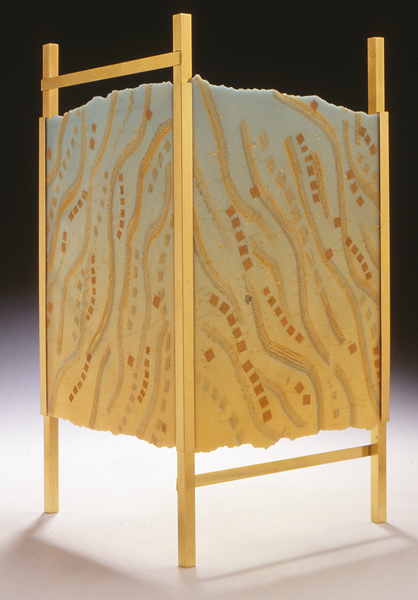 Once back in my studio, I began experimenting with paper-thin sheets of clay. This first fan was created from canes I’d made in Pier’s foil core class. Once I found techniques for making bubble free, flat, strong flexible sheeting, I began to play. Inspired by handmade paper techniques, I tried incorporating threads and other materials into the sheets. Over the next year and a half, I experimented with many differing renditions of the fan – exploring a variety of surface decorations and construction concepts then grappling with practical design issues. By the time of the MIPCES exhibition in May of 1997, I had constructed three presentation boxes in order to debut that first generation of fans. You’ll see those pieces in the next post. Working with thin translucent sheets eventually evolved into a series of translucent screen sculptures which you’ll also be able to see in coming posts.